Pick your own pace on a self-guided, downhill bike ride. Follow the route of the whitewater rafters and ride along the former railroad bed that parallels the Lehigh River. An unforgettably unique rails-to-trails pedaling adventure. Beginner to expert riders are welcome at Pocono Biking. Bring your bike or rent a Trek bike. The trail is unique, as it was once home to a railroad system used to transport coal. When pedaling on the trail, you'll encounter wildlife, history, waterfalls, a series of locks and dams, and more! The Rail-Trail runs along the Lehigh River so you'll have beautiful views the whole ride! 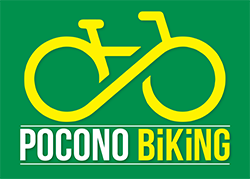 Join Pocono Biking on a relaxing, slightly downhill adventure. Pack a lunch and enjoy a riverside treat at one of the picnic benches on the trail. Located in the historic village of Jim Thorpe, Pocono Biking is a perfect location for your day trip. Call today!